Blog Home What Size Heater Does My Pool Need? We get questions from customers every day about pool and spa products - their use, installation, maintenance, and so on. We're beginning a new feature here on the blog to help address some of the most frequently asked questions we receive. Today, we consider the issue of choosing the right sized heater for your particular needs. People use their pools in differing patterns, particularly when the weather turns cool. Some prefer to set the water temperature to fall no lower than a specific minimum, which implies routine heater use (much like a thermostat regulates home heating). Others use the pool far less often in the cold weather months or only want to turn on their heater when necessary, such as preparing for a specific event. No matter your usage preferences, there are four basic steps to take in order to determine heating requirements for all situations. This information is important because water volume dictates how many BTUs will be needed for a specific pool. BTUs are a measurement that represents the heat necessary to raise one pound of water one degree Fahrenheit). Heaters, as you've probably noticed, are identified partly by their BTU capacity per hour. Determine how many BTUs will be needed to raise the temperature throughout the pool one degree Fahrenheit. As we said BTUs are based on pounds, and one gallon of water weighs 8.34 pounds, so the pool from the example above has 225,180 pounds of water. Find out how many BTUs are required to achieve a one-degree temperature change within a 24-hour period. To do this you'll divide the pool volume in pounds by 24. Now that you know how much heat is required to achieve one degree of temperature change over 24 hours you can use that as a multiplier, along with the number of degrees of desired temperature increase, to determine how many BTUs are necessary for your pool to reach the intended temperature in the 24-hour time frame. That temperature must be maintained, of course, but this can ordinarily be done with no more energy required than that used in the initial warmup phase. 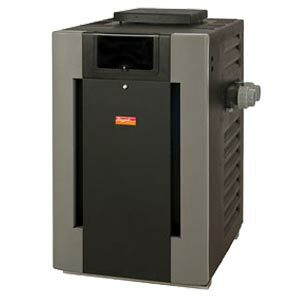 When it comes down to it, the gas heater (as the comparative BTUs suggest) will finish the job faster, and at less cost up front, but the heat pump is a more long-term approach, more likely to provide years of reliable service. No matter which route makes more sense for you, It pays to treat your heating purchase as an investment. 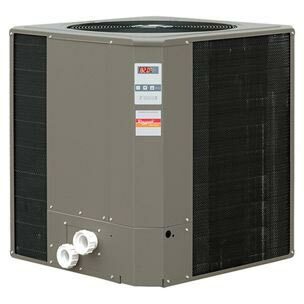 You will find that the jump in price from one size to the next (in both heaters and heat pumps) is not substantial in a relative sense. Going up a level or two in capacity from the minimum baseline you determined earlier won't greatly increase your energy consumption, either. A larger model, also, will require less time to perform the same amount of heating and thus be subject to less use. Finally, it's important to remember that using additional methods to keep the pool warm (solar covers, solar panels, etc.) is another key way to place less strain on the heater itself, which can add years to its usefulness and provide a consistently comfortable pool. Check out one of our previous posts about additional heating methods for your pool.